While NRB Bearings’ presence in the overseas market is already noteworthy, with clients like Mercedes, Bosch, Mazda and Honda, the company wants its bearings to be present in every vehicle in the world. Harshbeena Sahney Zaveri, Managing Director & President, NRB Bearings Ltd.
Harshbeena Sahney Zaveri entered NRB Bearings as a management trainee in 1986, when the company’s sales was just Rs.10 crore. In 2016, almost 30 years later, NRB Bearings has been conquering auto markets in India and across the world – brand by brand, and had an annual turnover of Rs.670 crore in FY2014-15. Some of its clients include Mercedes, Bosch, Honda, Audi and Mazda. Under her stint as the President, since 2001, the company’s revenues have grown multifold. Today, NRB Bearings supplies its products to French, German, Swedish, and US companies. This is in addition to the domestic market, where NRB claims to have about 90% of Indian vehicles running on NRB bearings and parts. Having tasted success in the global automobile market, the company now wants to become the world leader in design and production of customised friction engineering, with a presence in every vehicle in the world. 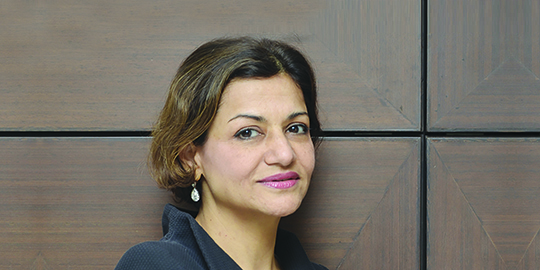 Having graduated in Urban Studies and Anthropology from Wellesley College in Massachusetts, an institution famous for developing women leaders, Zaveri has been a phenomenal source of inspiration and motivation to women across the country, with her engagements in NGOs, education and entrepreneurship-related initiatives. TDB: How does it feel to be one of the most successful businesswomen in the country? Harshbeena Sahney Zaveri (HSZ): I like the opportunity it gives me to guide and mentor other women. TDB: What parts of the world is NRB exporting to? HSZ: Primarily to German and Swedish-owned companies.Globally, we are exporting to 26 countries across five continents. TDB: What is the share of revenue from the overseas market? Who are your major clients? HSZ: It's roughly 20-25%. Our major clients include ZF Group, Volvo-Renault, Daimler, Bosch, Honda, Getrag, Mercedes and Mazda among others. TDB: How do you ensure high-quality products? HSZ: We are focused on quality and design engineering. We ensure these through training, zero tolerance on quality issues and investments in research and development. We employ best-in-class machines to manufacture high-quality precision products. TDB: Professionally, who has inspired you the most? HSZ: I graduated from Wellesley College in Massachusetts which is focused on developing women leaders. There are many women and men professionals and alumni who have mentored, inspired and helped me gain confidence. TDB: If women from privileged background find it hard to make it big in business, so do all the under-privileged. Agree? HSZ: Yes! You have to prepare better and be more thorough and dedicated. Women from privileged and under-privileged backgrounds have some unique but mostly common challenges. In 2016-17, HCIL sold 1,57,313 units, about 18% less compared to the previous financial ..
Volkswagen is re-launching premium sedan Passat, in addition to its hatchback GTI. Presently, the trade between India and the UAE is estimated at $60 billion. The NEDFi will set up the NE Venture Fund to encourage startups in the region.